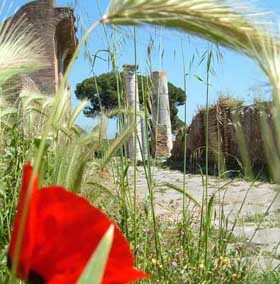 Ostia Antica is Rome's own, nearly-secret Pompeii. The ancient port town is a fascinating and under-visited archaeological site. Ostia Antica is not far from the centre of Rome, and makes a pleasant half-day (allow longer if you want to lunch there or are particularly interested in archaeology). To get there, take the suburban train line to Ostia from Piramide Station (which is on Metro Linea B). You can use your normal Rome travel ticket. The train goes all the way to Rome's seaside town, Ostia Lido; the Ostia Antica station is about twenty minutes from Rome. The archaeological area is close to the station, over a footbridge - follow signs. There are a couple of restaurants near the ruins, and there is also a restaurant inside the site. Although it is now 4 km inland, Ostia was originally developed as a sea port, prior to the silting up of the Tiber's estuary. Ostia increased in importance from the fourth century BC, becoming a major naval and trading base. As Rome's port, the town had obvious commercial significance, and expanded in size and grandeur to match this position. However, during the third century AD, its place was taken by a new port at Fiumicino, and within the next couple of centuries Ostia had begun its decline. The Tiber was no longer navigable, the roads were overgrown, and Ostia sank into muddy oblivion. Nowadays much of the old town has been excavated, and the visitor is free to wander and explore at their will (get a street plan from the ticket kiosk). There is a lot to see, and a leisurely wander is extremely rewarding. Major sites include the Roman theatre (there are plays put on here in the summer), the impressive Forum, a large baths complex and more than one Mithraeum. Many of the buildings are preserved up to the second storey, giving a powerful sense of the past. There are impressive mosaics and columns everywhere (statues are mostly taken away for safekeeping), but highlights include the smaller domestic details: the fishmonger's marble slab, the bar with its wares illustrated on the wall, the communal public toilets, the residential villas with peaceful courtyards. 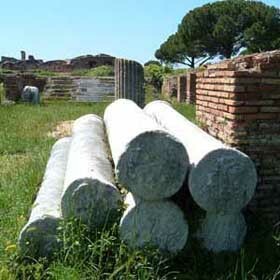 The old village of Ostia, with a papal fortress, is just down the road from the Roman town. Modern Ostia - Ostia Lido - is further away, by the sea. It is an ugly construction of modern apartment blocks and boulevards with no atmosphere and - thanks to high fences - not much of a sea view either. Romans come here to sunbathe but the beach is nearly all private, crowded and unattractive. You're better off travelling further afield for a more pleasant seaside experience.